Swiss Army knives are great knives to carry, but when you're traveling on foot, saving weight sometimes means choosing to leave the monster pocket tool kit at home. The Swiss Army Centurion offers just what you need with two good features you might not expect. The Swiss Army Centurion -- 4-3/8 inches long when closed -- offers a high carbon stainless set of tools including a plain-edged spear point knife blade and large and small flat head screwdriver blades that double as bottle opener, wire stripper, and can opener. Other tools include an awl/reamer and Phillips screwdriver, key ring, tweezers, and toothpick. The Centurion's contoured plastic and aluminum grip offers enough handhold for comfortable use and high torque, but still isn't too heavy for the pocket. Slip a wrist lanyard onto the key ring and it's safe and secure for travel in the wilderness. What you might not expect is a secure liner lock -- a great feature for a main blade but one that hasn't always been standard issue with Swiss Army. Not only that, the larger of the two screwdriver blades also locks open. We can be trained not to use that main blade unsafely, but if you're working on a stubborn slot-head screw, you need extra pressure. Folding up the bottle opener on your finger doesn't do as much damage as the knife blade would, but it's still a problem we'd rather not have. The more liner locks, the better. 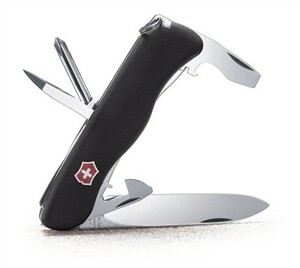 For a similar Swiss Army lockback with an alternate set of tools, see the Swiss Army Forester.